Posted on October 4, 2012 by Elizabeth E.
I smiled. A great big smile. Wowsers! 100 followers officially here. Welcome everyone! 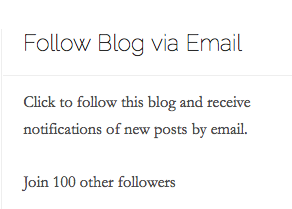 I guess that means my blog has now grown up a bit, and can stand up straight on the playground of blogs. This means I won’t get picked last for softball or kickball and that maybe, just maybe, I’ll be able to clap the chalkboard erasers after school. Wait. Wrong era. No erasers anymore, right? And probably no chalkboards, either. I ironed the backing for Summer Treat. As I was working on this, it struck me on how lucky I am to be working with all this beauty. I had Harvesting the Wind on the pinwall, and was ironing the giant cirles of the backing on my fancy-schmancy ironing board cover. I stepped back and took a shot just to remind myself that when I’m parsing logical fallacies, comma splices and MLA format, I really do have this vivid other life that feeds me. Pinned Summer Treat on the bed while listening to the presidential campaign debate analysis on NPR. Nothing like keeping your mind busy while your hands are busy, too. 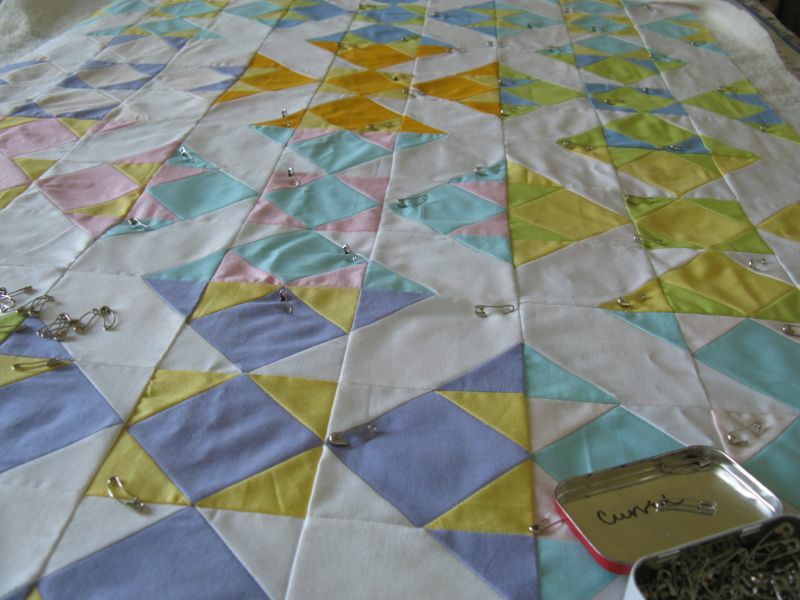 I plan to work on this quilt, plus a few other things this weekend, when my church has a world-wide conference. They broadcast this conference twice a year, in April and October, and it’s so nice to quilt and listen and refresh that side of me that needs to think Deep Thoughts occasionally. 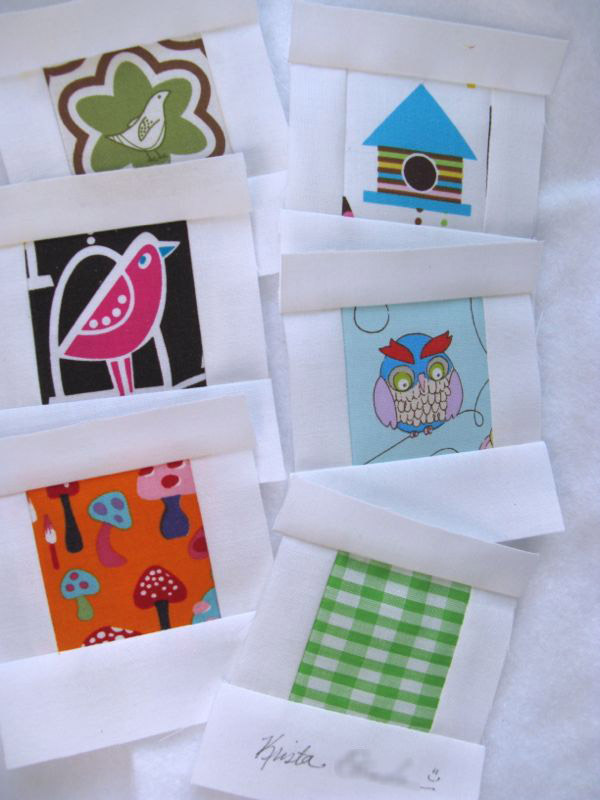 Next I dragged out my Polaroid Blocks to finish off. I’d made 50 and sent off to the swap, and received quite a few interesting and wonderful blocks in return and they’d been sidelined in my studio. 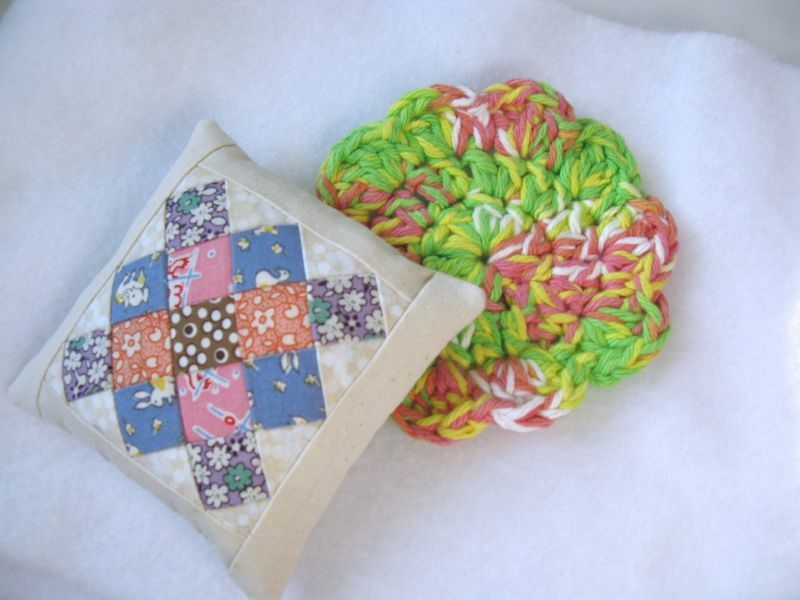 She also sent me these two little treats: a scrubbie (but I’m using it for a mug rug) and a sweet teensy little granny square pincushion. I pinned it up on my wall for my gigantor pins I use (like corsage or hat pins) when I am monkeying around with fabrics. Thank you, Krista! One of the steps in Polaroid Blocks is trimming up–we receive them “untrimmed” and so I stood at the table and trimmed up 140+ blocks this evening, while listening to more debate analysis. It’s been interesting to teach the rhetoric of political speech in my Critical Thinking class this semester. I’ve had to pay attention a lot more, and be more “critical” in the classic sense about what is said in the campaign. Five more weeks, everybody. 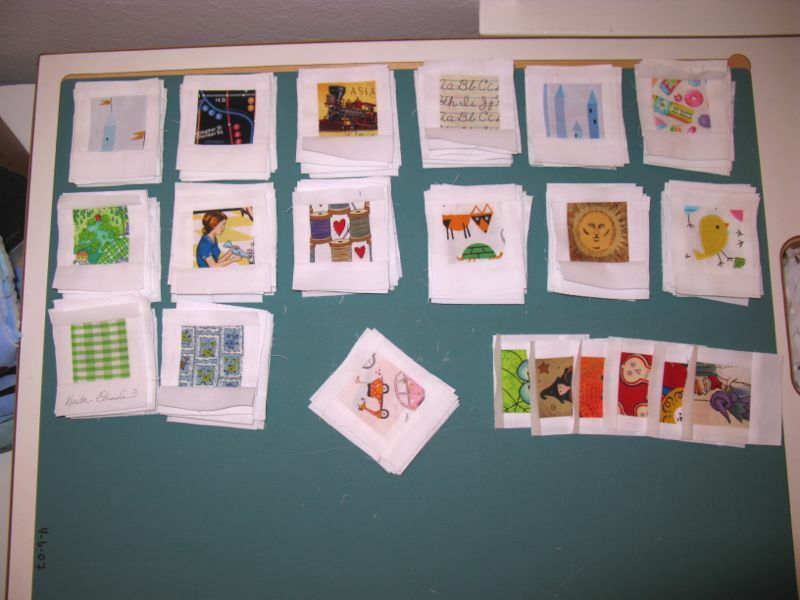 Here are the blocks in stacks of ten, plus a few pulled out to the side for a Halloween tote bag. The tilted stack is a few short of ten. 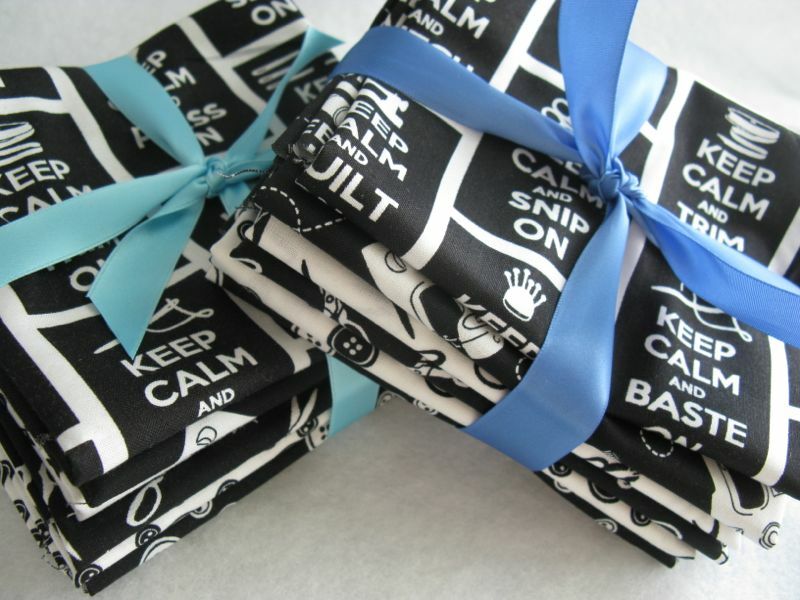 Tomorrow night I plan to work on bordering them for my quilt (I’ve sort of thought up a design. Sort of). I’m taking them over to Simone’s where we are having Quilt Night. One of her daughters likes to look at these, so I’m hoping she’ll help me pair them up by fours, which is what I need for my plan. A nine-year old brain can often do somersaults around my old brain. Before I head over there, I’m printing off all the names of those who have entered my black and white giveaway. So you have until Friday, 5:30 p.m. West Coast time, to enter your name if you haven’t already; click *here* and leave a comment. I’m making two stacks: one with everyone’s name and another one with followers (both here and on Google Reader, if you mentioned it). I’ll announce the winners Saturday morning, after I rub the sleep out of my eyes and get back to the real world. But I’ll still be smiling! Congratulations on reaching 100 – knew it would happen!! And I love the Portuguese tiles quilted, gives me extra inspiration to get mine started. Btw, if you ever see another Polaroid block thingy window, would you share it with me please? Would love to participate. Come on Dec. 8!!!!! Congrats on 100 followers and love all those polaroid blocks! What would we do without our “other” lives?! 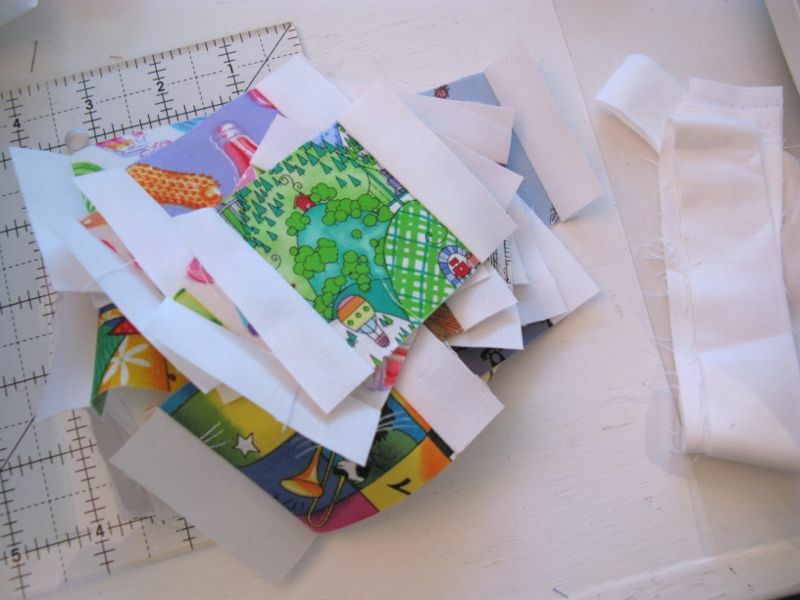 I absolutely love walking into my sewing room–it’s an instant “pick-me-up.” And while I, too, am burdened this weekend with a stack of papers, my stack is decidedly smaller than yours. 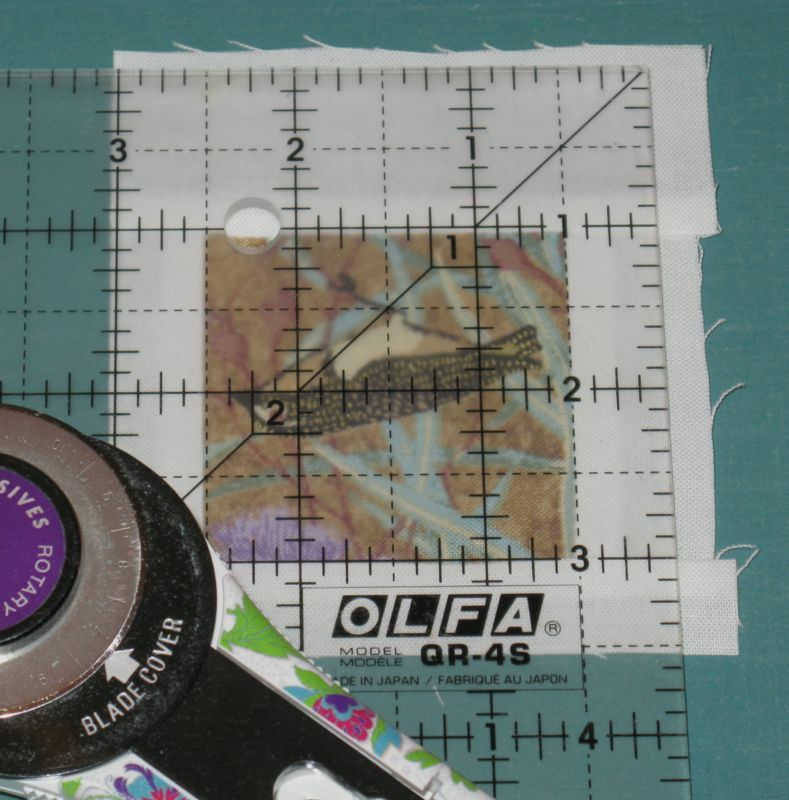 I love the Polaroid blocks–what a fun quilt they will make! Wowsers–that gave you a lot of energy!! Beautiful pictures. That signature block from Krista is so cute! Have fun tonight. Wowsers is right! How do you get so much done and teach! 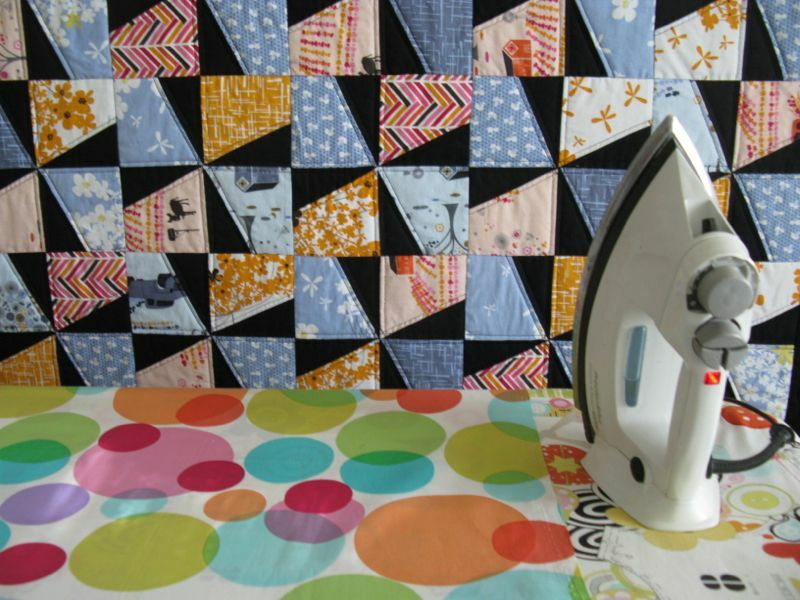 I love your quilts, just beautiful. Hope your students appreciate you because I sure appreciate your blog. Thank you. Just finished catching up; you’ve been busy! Love your Portuguese Tile quilt. I think we have similar stacking methods for keeping blocks in order when on the way to the machine… I have also found the camera on my phone handy for that, too. I take a picture of the layout frequently since my design wall is the floor and I can’t just leave everything out until a project’s done. 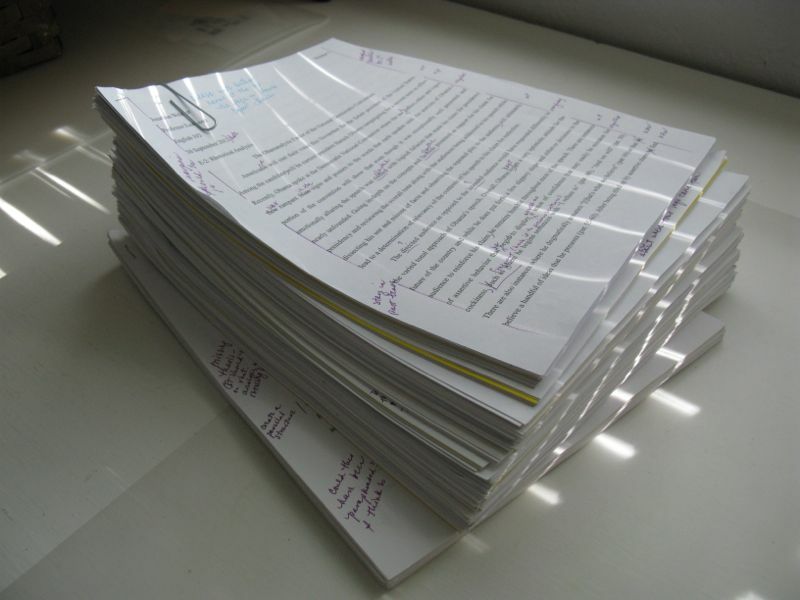 That stack of papers looks HUGE. I have finally worked my way onto the substitute list so I’m thrilled but also kinda glad that it doesn’t mean marking any essays for awhile. I don’t think it ever gets quicker when you’re a good teacher. Rubrics work efficiently for many things but papers aren’t one of them. I hope your next stack goes smoother. Have a great week! Glad to see your email :). I do use a rubric for these papers, but it’s more like a scoring sheet that I vary only slightly from essay to essay (because they have different requirements). I liked many parts about substituting, ESP the lack of grading. Then I got a long-term substitute and it was awful–tons of lesson prep (because no matter what the teacher says, they don’t give you long-term lesson plans) and TONS of grading (I taught 4 classes in a high school). That’s when I learned I didn’t want to do HS forever.